Quick overview The most famous crossword in the world. Test your word power with this classic collection of 80 cryptic puzzles compiled by the former Editor of The Times Crossword. The most famous crossword in the world. Test your word power with this classic collection of 80 cryptic puzzles compiled by the former Editor of The Times Crossword. The latest book in this exciting series continues the tradition of providing authoritative, highest-quality, challenging cryptic crosswords, offering an enjoyable and stimulating way to while away your free time. 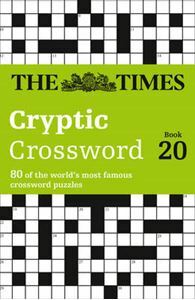 Addictive, taxing and compelling, The Times Cryptic Crossword Book 20 is packed with 80 high-quality puzzles chosen by the former Times Crossword Editor Richard Browne.